Cute red Santa Claus themed Christmas badge. 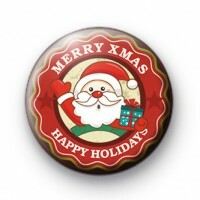 This 1 inch badge has a cute illustration of Father Christmas and the text Merry Xmas Happy Holidays around the edge. It is a great badge to give out at your Christmas Party, pin to your Christmas Jumper or include as a handmade Stocking Filler. We have over 600 Christmas Badge designs to pick from so make sure you check them out.